Play Chess against Computer, beat this chess program below which is pretty strong and impossible to beat if you are a beginner at chess. This online flash chess program below does not play as strong as commercially available chess software. I estimate the playing strength at 1700-1800 Elo whereas top PC chess software has a strength of around 2800 Elo, which is super chess grandmaster level. Only a few players have a strenght of more than 2800 Elo. On top of that, popular PC chess software has many features like training modus, analysis function, opening book, adjustable playing strength, a database of millions of games and more. PC chess software is used by all chess grandmasters and many chess players worldwide to improve their playing strenght. If you are a beginner I recommend you start first move 1. e4 as White and answer 1. e4 with 1…e5 as Black. After that get your kingside pieces out, your kingside knight and bishop to be able to castle early. Play Chess in big resizable Window – Click here! 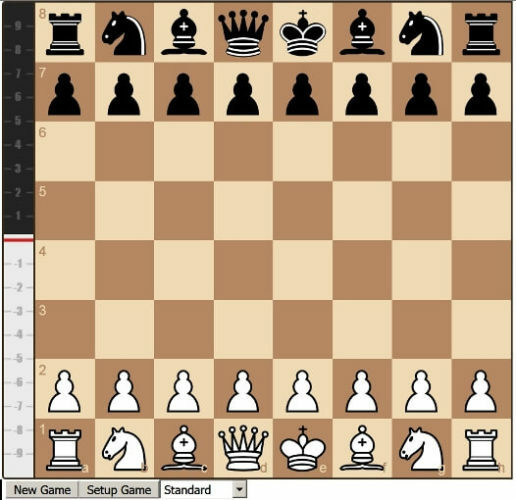 You also can play chess against computer versus different chess programs below to test your playing strenght and get some training. This is necessary to get your mind going and stay sharp. You can try your prepared opening lines and see how far you go. Get High Quality Chess Courses from a Chess Grandmaster! Develop your kingside as quickly as possible to be able to castle early to bring your king into safety. Don’t waste time by pushing too many pawns. This loses valuable development time. For example: when you move the edge pawn (a-pawn) in the opening the computer might develop a piece instead and you soon run behind in piece development and come into a bad passive position that might be already lost. Study a specific opening and apply it all the time. This way you get routine and learn more and more about your selected opening system. Study only good and sound chess openings that are played by chess grandmasters or you waste your time. Don’t move out your queen early but first get your pieces out and castle. Only beginners get the queen out early and then the opponents’s pieces will chase around the queen and get developed at the same time and the opponent gets a winning game quickly. Get this into your head or you will never become a good player! Control center squares, create outposts and improve your position all the time. Look which piece is badly placed and try to improve its position. Don’t attack right from the beginning. This is just ridiculous. How can you get an attack when your pieces are still placed badly? This is impossible and makes no sense. Always check your opponents last move or you will soon run into traps, forks and pins of all kinds and lose outright. Don’t move a piece twice in the opening. This wastes time and loses. It’s simple as that. I never understood why some players don’t understand this simple truth. If you move three times with your bishop in the opening stage then your opponent has developed already three pieces and you have developed just the bishop during this time. This is logical or not? He soon will have developed all his pieces and you will get overrun. a knight is better than a bishop. If your position is blocked then trade your inactive bishop for a knight. To take is a mistake! Don’t trade pieces for no reason, because you just develop pieces of your opponent. This makes him stronger. Always look which of your pieces are placed badly and try to improve their position if you can. Always try to find the worst-placed piece and make his position a little bit better. Don’t place pawns in front of a bishop or the power of this bishop will be reduced. If your pawns are blocked on white squares then your white-colored bishop will become inactive. Get rid of it and trade your dead bishop for your opponents more active bishop or for his knight to improve the energy level of your game overall. Get this: In a chess game everything is relative and the power level of pieces changes constantly, so understand in which area you can improve your game and which of your pieces has become a bad and inactive piece and work out ways to improve it or trade it off. Trade off the most active piece of your opponent to cut off his initiative. Always trade his active pieces to ease your game and stop and block his aggressive plans. This is by far the strongest chess program on the net. You will never beat it. It will take you apart like nothing. Just use it to test your chess opening variations and chess strategies. Maybe something will stick in your mind when you see it playing. Good Luck! The first two programs below are good for beginners, the other one and this one here are fairly hard to beat. If you can beat them you are pretty good.